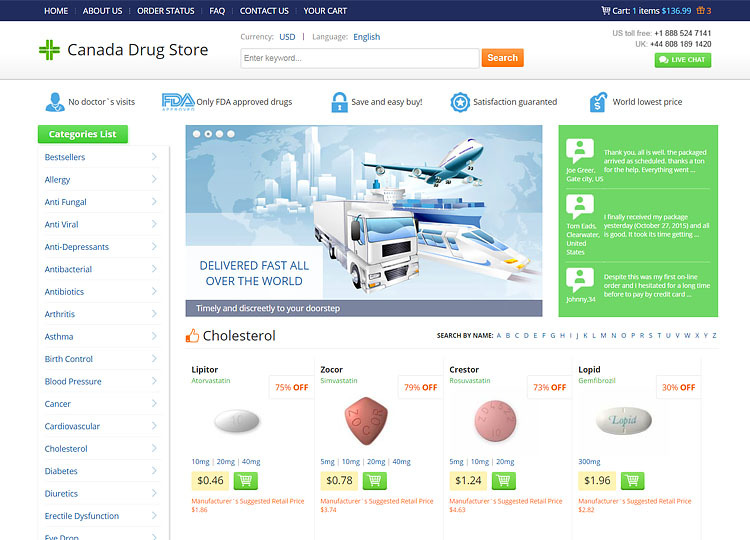 Official-Drugstore.com is an online pharmacy which claims to have been one of the first to sell generic medication and that they have fulfilled over 500,000 orders. They say delivery is free and that you can trust them. Our investigation shows very clearly that you can’t trust them, with false claims and misleading statements at every opportunity. Details of domain address registrations are available to check for any website. 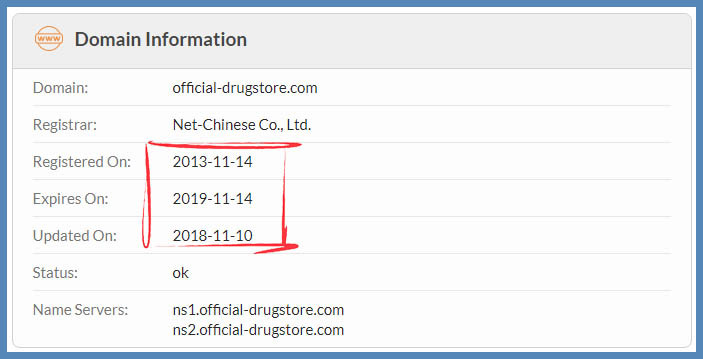 The record for this drugstore shows that this name was registered in 2013 and a Chinese company was used to register the domain. Longer registrations normally suggest that the site is more reliable and this domain has been around longer than many. It is interesting that the name was registered with a Chinese registrar. Normally people will use businesses in their own country when registering domain names, for obvious reasons. Finding the contact information for an online pharmacy can increase your trust in them. This store has their address on their contact page. 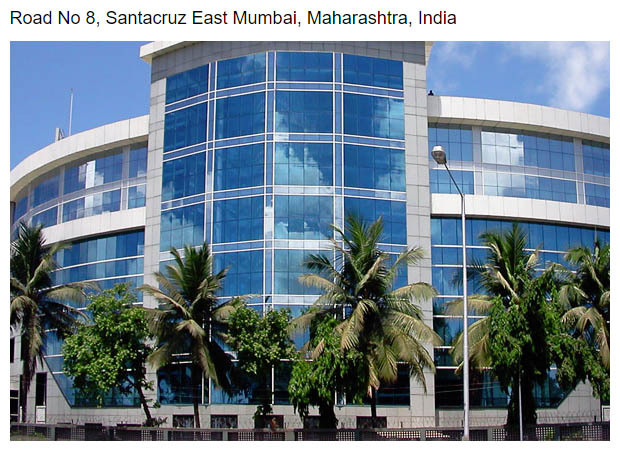 They are based in Mumbai, India and they have a photo of their impressive business premises below their address. 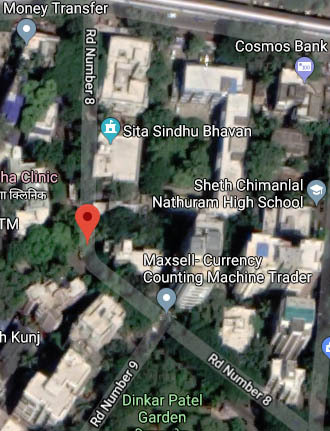 This address may be correct, but when we check satellite imagery, there strangely doesn’t seem to be a building like the one shown on that road. Perhaps this building has been constructed since the satellite image was taken, but it is more likely that this is just a stock image that the owner’s of the site have used to make them seem more reputable. 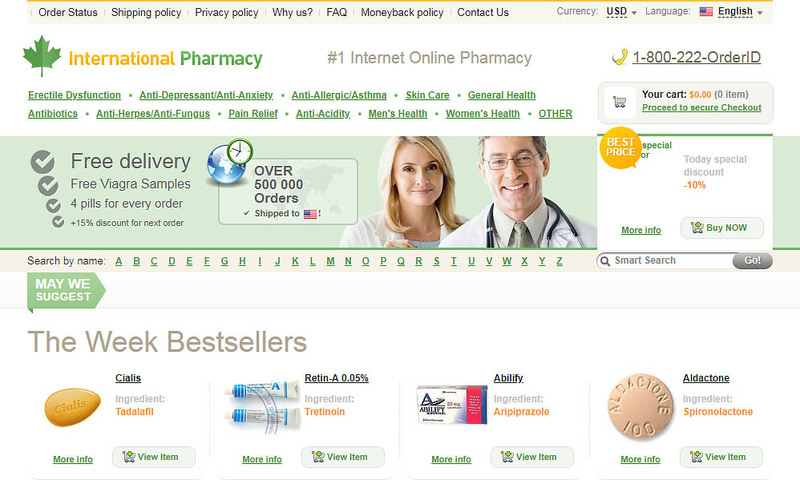 When we first look at this online pharmacy there is a blatant issue with this site. 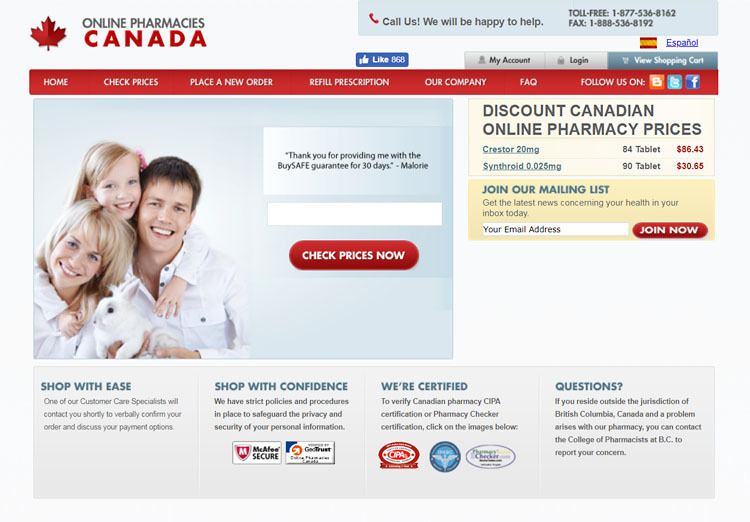 The store has a logo which says ‘International Pharmacy’, but this doesn’t relate to the domain name used for the site. The logo also has a maple leaf which would imply that this is a Canadian pharmacy when actually they give an Indian address. The only mention of the domain name, on the site that we have found, is next to the copyright information. The copyright dates they give appear to be a lie. They say 2004-2019, but as we have already shown, the domain name was registered in 2013. The store has a graphic which proudly boasts of shipping over 500,000 orders to a particular country. However, the country changes depending on where your IP address says you are located. This is another obvious lie. 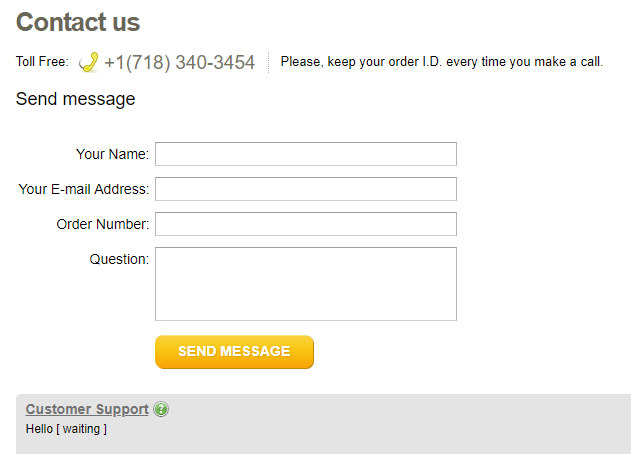 There is no way they have received such a high number of orders from so many countries. All of these attempts to deceive potential customers points very clearly towards this pharmacy likely being a scam. If they are lying about these things it makes us wonder what else they are lying about? When an online pharmacy has attained regulatory approval they are allowed to place seals and logos from the regulator on their site. This drugstore has no such seals or logos anywhere on the site. LegitScript gives a damning review of the online pharmacy. They classify the store as being a rogue, violating the laws of the countries they sell to and where they operate from. 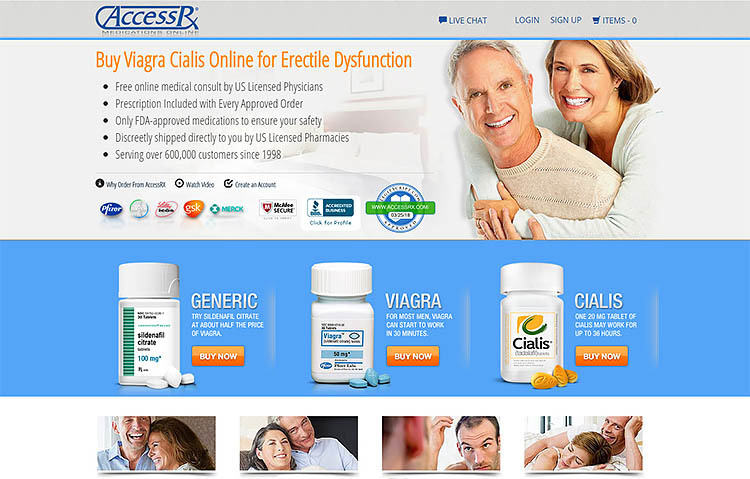 This online pharmacy provides access to a fairly good variety of treatments. 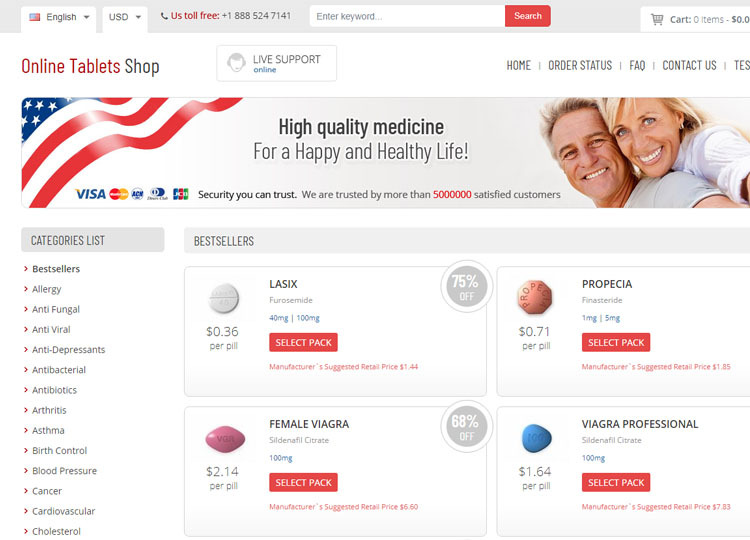 The main focus of the store is, however, the selling of men’s health pills. To highlight this, four free men’s health pills are given away with every order. They say that they sell both generic and brand-name pills. Our suspicion is that there is a high chance of receiving fake and counterfeit pills from this retailer. We think this is likely as they don’t tell you where the pills are coming from or who manufactured them. We are left to assume the drugs are sent from India without confirmation. This pharmacy state very clearly in their FAQ section that they do not require a prescription regardless of your order. This lack of requirement raises many concerns. They do suggest you seek a medical opinion before ordering but it is just a suggestion and most people will not. This increases the risk to patients by ordering medication which isn’t appropriate or which reacts with other drugs being taken. We haven’t been able to find a coupon for this drugstore. If you make a second order from this store you can receive a 15% discount. However, we don’t recommend you even make the first order from these scam artists. The checkout section of this store is secured by the minimum SSL certificate, making sure you don’t lose your financial details to hackers when you place an order. The site accepts Visa, Mastercard and e-check to pay for your medication. Delivery is by either airmail or courier. Airmail will cost you $10 with delivery expected in 10 to 18 business days and this option doesn’t come with a tracking number. Courier delivery does have a tracking system but the cost is greater at $30. Courier shipping time is expected to be between 3 to 7 business days. Free airmail delivery is offered on orders in excess of $200, and not on all orders, like the store would have you initially believe. Although, when we used the live chat option we got no response and were left waiting for over an hour before we gave up. Bearing in mind what we have already discovered about this pharmacy operation, it doesn’t seem very likely that they provide their customers great support when things go wrong. We have searched for Official-Drugstore.com reviews, but have been unable to find any. For a business which claims to have received over half a million orders from people in multiple countries, this is amazing and unbelievable. This lack of being able to find previous customers only goes to highlight how stupid their half a million orders lie really is. 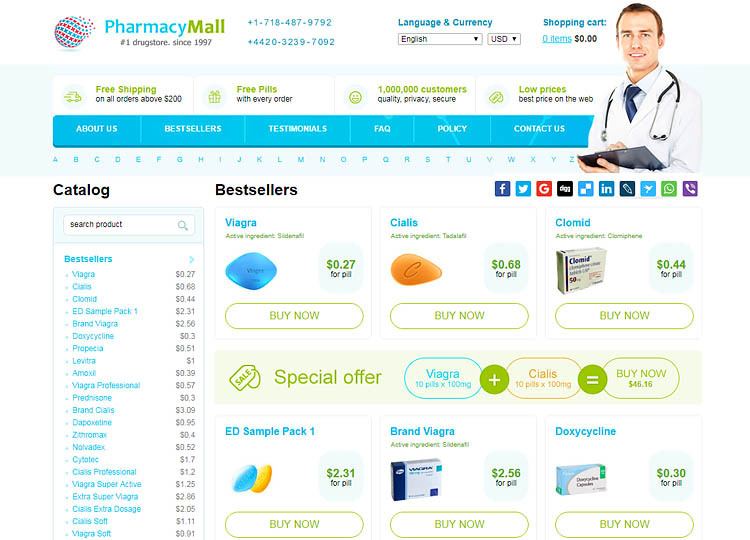 There is an awful lot of problems with this online pharmacy. They have no regulation, we can find no reviews and they are very happy to lie to you at every opportunity. We have no trust in this drugstore and the people operating it. We conclude that this is very likely a scam which may be supplying fake medication, therefore our rating is only 1.2-star out of five. Avoid this drugstore.